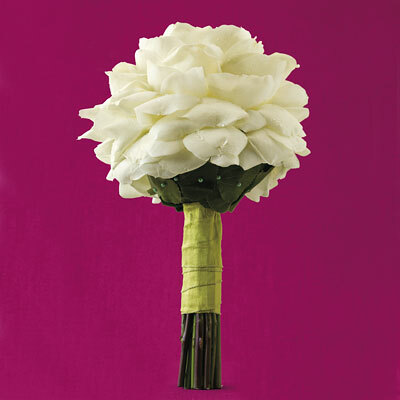 These glamelia bouquets are handmade from individual rose petals and crafted to look like one large bloom. I have no idea how much one would cost (given the handmade angle I am guessing they aren't cheap) but aren't they beautiful? You could make them any color that you would find a rose in, and I just think they're so unique. The first picture is from InStyle Weddings and the second is from Kuga Designs blog, which includes a few pictures of a tutorial. They are gorgeous! I bet they do cost a lot. Oh my goodness, what will they think of next?! Simply stunning and SO impactful. I can see a troupe of bridesmaids each carrying one of these. And can I tell you how much it pleases me that they thought of such a hilarious name for these creations! Katherine Heigl carried one of these at her wedding. (I read that in some wedding magazine.) They're gorgeous and so interesting! 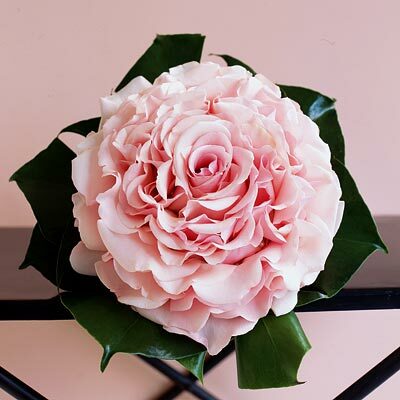 Handmade flowers are so perfect for weddings. It gives the personal touch. The cost isn't cheap but they are worth it. Bree, I did! I was married on Kauai on 10/10/10 and was determined to have the glamelia to complete my vintagy look. My fantastic coordinator found a florist who could create the bouquet for me for $200. roughly 3 dozen white roses were used. And while they didn't wire it but glued it, the look was complete. Let me know if you'd like me to send a photo/link.